Ballet Class – Moments. Minutes. Memories….. I took Rylee to her ballet class tonight……..I love doing this and try to do it at least once a month. When I picked her up she was all dolled up in her new sunglasses that her Daddy bought her. 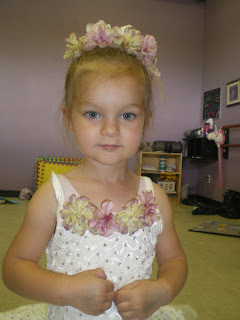 I took her picture as we walked into the dance studio. 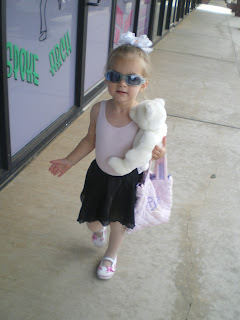 She looked like a celebrity with her bear, bag and sunglasses! Her first dance recital is at the end of this month and tonight was the night they got their costumes. She was so excited and we couldn’t get it on her fast enough. She was really prancing around in it. She looked beautiful! Then we discovered some flowers for her hair in the bag and she wanted those on as well. 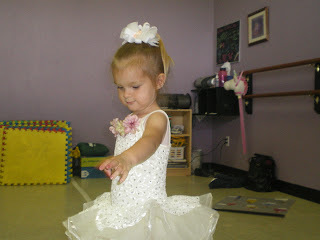 I think she is the most beautiful ballerina I have ever seen! She is a doll…so beautiful. I know your heart melts every time you look at these pics. She is a blessed girl to have you in her daily life, I wish my mom was closer.